For awhile shifting was something that felt important to resist. With change comes loss and grief about that loss. Letting go of what was in order to live what is felt somehow wrong or disloyal. I spent precious energies trying to recreate what can never be again and in that insistence upon constancy I forgot the core constant: The ground keeps shifting. Anything that cannot change will die. Biological truth is making its way to my heart. Around the table at Thanksgiving were beloveds. Some were missing. Those not present were joining other families or they were doing what felt important to them. Next year the same will be true. There will be those who are there and those not there and rather than lament or rail or whimper about what is not my heart was and is so full of what is. I am able to set a table and there are those who come. At church, in my home, and through my heart I am able to set a table and there are those who come. Folding clothes my heart was pierced. On the radio the strains of Serenade to Music by Ralph Vaughan Williams transported me to another lifetime. Suddenly I was eighteen and under the direction of Dr. John Hunter at the University of Wisconsin, Whitewater. My only previous experience with choral singing was with a mighty fine church choir but I was little prepared for singing in the select choir at UW-Whitewater. I will never forget the first rehearsal when fifty voices joined as one. It changed my life forever. The man who wove the strands was a Texan by birth. He was huge of heart, exacting and had a laugh we sang for. His conducting was fluid poetry and his soul desirous of communion and he got that from his singers. I fell in love. I fell in love with heart given soar through music. I fell in love with friends who are life companions yet. I fell in love with choral literature diverse and resonant. And of course I fell in love with Doc Hunter. I wonder. Did he have any notion that years after his death one of his singers would gasp upon hearing music previously shaped by his hands? Oh, to be eighteen again, broken open by amazement. Oh, to be fifty-six, broken open by gratitude. Every year the church pauses to name the saints who are no longer physically with us. This year we will be shepherded into and out of worship by bagpipes. The blast of sound will serve as a musical rupture of the thin veil separating the living from the dead. The service is so very alive. We name church members who have died in the previous year and project their faces onto our screen as we savor the ways they have blessed and changed us. This year our church has been changed by 20 deaths. While the grief around their passing is so very real so too is the pleasure of saying their names and remembering their being. 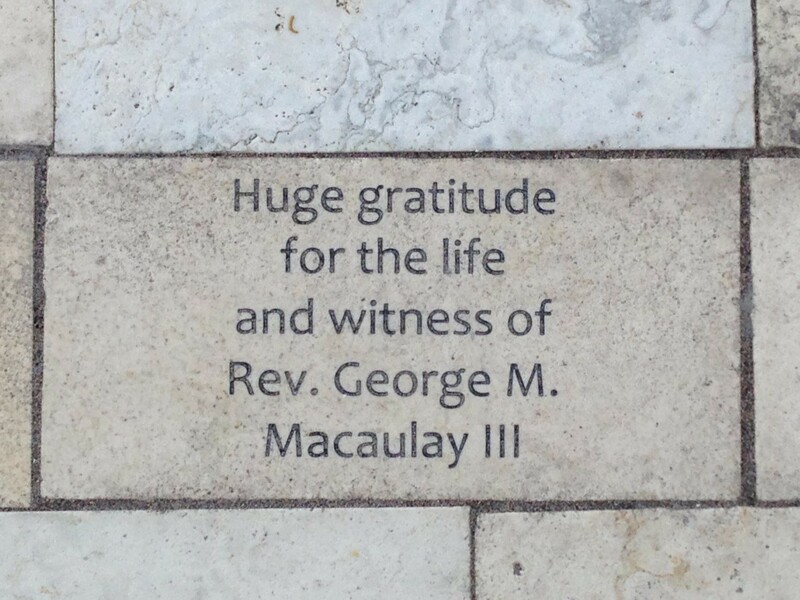 The seminary that I attended offered an opportunity to memorialize beloveds through buying a paver for a newly finished chapel courtyard. Since my father was for a time adjunct faculty at UTS and since my heart longs for places and times where his name can be in the hearts of the now, it felt so good to create a reminder that once he was, even as he still is in the hearts of many. And of course during this thin veil time, I wonder about my own death and the day when it will be my face on the screen, my name on the lips, my being bookended with birth and death dates. Tomorrow we name those who answered that question every day they were given. And so it comes to us. How is it we plan to enter fully the wild and precious gift that is life? Mindfully or no, we live our answer. I have been blessed with powerful teachers in my life. One is a seminary professor who has written extensively and agitated consistently about the issue of language, particularly language used for the Holy. She is a part of the church community I serve. Amazing grace, that. Her wisdom is with me as I write worship week after week because I know so very well the psychic disequilibrium that has been perpetrated against women through the ways we name God as male male male. The United Methodist hymnal – all three iterations currently in use – has perhaps a handful of hymns that name the sacred using feminine imagery or pronouns. This from a denomination that proclaims a desire to welcome all into transformational relationship with the Holy. Parker Palmer maintains that “the soul is shy. It won’t show up unless it feels safe.” How can soul show up in a culture that asks it to participate in “a game done with mirrors”? Every week this tension of finding hymnody capable of inviting embodied praise. Every week the realization that the soul crush of non inclusion is perpetrated in uncounted sanctuaries. According to Adrienne Rich, it takes individual strength and communal understanding. As community, will we welcome those who stand up and demand to be heard? Can we unpack the depth of woman-demean that provokes disgust at the very notion of feminine divine? I’m tired of psychic disequilibrium. I’m tired of trying to choose the least offensive hymns when song is meant to sing – not silence – the soul. The Prayer of St. Francis invites us to ask God to use us as instruments. I am feeling like I have been well played. Today my eldest marks her last birthday in her twenties. Twenty nine years ago I was little prepared for the heart-stretch wonder of being a mother. I so savored carrying her life within my body. Certainly I loved her unfolding and promise as she grew and claimed her space within me. But nothing prepared me for the stunning miracle of the way her eyes and heart and hands are so fully open to life and love. Nothing prepared me for the sheer terror of responsibility and the deep sense of completion found in being her mother. The shine of her eyes during night feedings and the song of her morning salutations live in a place in my soul where I am pregnant yet with life. There are many words that describe my being in the world. Leah’s birth gave me the name of my most resonant calling. I am Leah’s mother, blessed with bearing witness to the song that is her life. My mom is coming for Christmas. It’s a seemingly simple sentence dense in power. We are, we two, not unlike lots of moms and daughters. We have spent the 55 years of my life clashing wills and life views. My mother is a woman who knows with certainty what is seemly and what is not and her surety has extended to the needful state of cupboards (pristine!) and planned menus for each meal. Her daughter? Not so much. For some reason my mother was presented with a girl-child who resisted blacks and whites and rebelled against imposed order. We have lived, we two, a challenge. I don’t know what it is about mothers and daughters. The desire to protect, the temptation to create in our own image or the image of what we wish we had been able to able to call our own; so many things swirl beneath the surface of this elemental heart dance. What I know is that my relationship with my mother affects my daughters and will affect their daughters. If there is work to do, running from it robs not only me and my mom but the generations that follow. So we have worked. When it might have made sense to let it go and play it safe, we have engaged with each other and risked the hurt and vulnerability of letting each other know that it matters. Our honest hearts won’t let go of each other. My mom is coming for Christmas. She will be in the midst of the feasting and the laughter and I know full well that she will bite back comments about how things might be better organized and I know full well that sometimes those comments will slip their way out of her mouth and into my ear. But they don’t have to take up space in my heart. What takes up space in my heart is profound admiration for the mighty mite that is my mom. She has endured much, lived much, and loved much. She has not let go of me. Gathering for Christmas means readying our hearts. We will mourn those absent, mark in our hearts the shifts and losses and remember years gone past when things were different. But oh, the chance to be present to the wonder of the Word Made Flesh in our midst is stunning gift. We get to learn what it is to love. I thought I was done, except in a bittersweet way. Preparing for a sermon this past Sunday, I was thinking a lot about heritage and the presence of the unseen guests at all of our Thanks Giving tables. The text had to do with a faith forewoman so it gave great opportunity to consider witness and how it sounds through the ages. I had my sermon set to go and had the perfect ending for it. Some thirty years ago, my dad was interviewed by the Minneapolis Star Tribune. It was a column about Thanksgiving and in it he reflected upon being a pastor and the gratitude he felt about being able to love and be loved wrapped in community. The long ago article ended with a Thanksgiving prayer. It hangs on my refrigerator at the cabin. I knew that Leah was there and could relay it to me. Except that she didn’t have her phone on. As the night dwindled and there was no word, I knew that I was not going to be able to speak words written by a heart I so miss. And then the grief swooped. The ache in my heart over my dad’s death was so raw. It has been sixteen years ago but I so wanted to “hear” his voice and share it with a people I get to be in ministry with. And the empty place of his friendship and his not knowing of my beloved and and and all those things fell into my heart and I missed my dad and mourned the huge space left by his death. All the little and large sharing of life we don’t get to share; it hurts. It hurts. And, it humbles. I barrel along my days and sometimes I am brought up short and reminded that life and love are tender precious fierce things and I am blessed to live them, I am. So may I share his prayer with you? Dear God it’s me. Remember? And it is Thanksgiving time and turkeys and football games and family gatherings and all sorts of special things are here and so am I and so are you. I know that we must be an abomination to you. Our existence is a continuing, helpless pollution of your world. We are terribly concerned with messy affluence, the insane rains of our bombs keep falling. It’s easy to mask who we are. We clatter with heavy shoes over the lives, the sensitivities, the joys and heartaches, the realness of our brothers and sisters. Appearances, of color, of dress, even of hair have a strange importance to us. We talk of love and forget to do it. But it is Thanksgiving time. And I would like to thank you for everything I have and everyone I know. For family and home in now and past, for friends. For those who touch my life with love. For smells and touches and eyes that meet. For my job, my car, the little things I take for granted. And they are all from you, and thank you God. Will you arrange it so I won’t have to say a table grace right out loud? That would be so predictable, so polite. I would far rather babble and shout.